The Serial module of the MCBTWRK60 tower system includes serial UART connected to the ICL3225E RS232 transceiver (U6), which converts the logic signals to RS232 voltage levels. 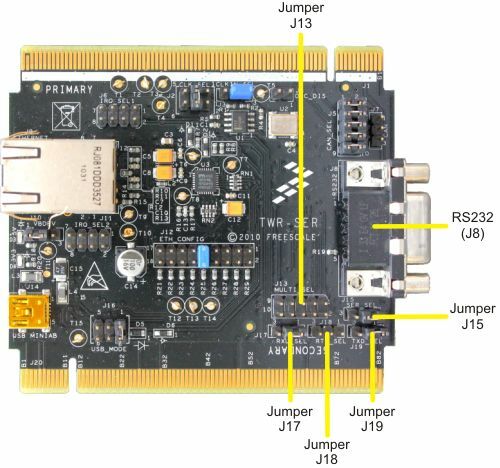 Jumpers J13, J15, J17, J18, and J19 configure the J8 connector for RS232 or RS485 operation. The RS232 DB9 connector is wired as a standard 5-wire TXD/RXD/RTS/CTS interface as shown in the figure below.